Rich in fiber, vitamins and antioxidants, raw broccoli has emerged as one of the healthiest diet-friendly foods on earth. Like cauliflower and cabbage, it's low in calories and provides a lot of nutrition per serving. When consumed as part of a balanced diet, broccoli may protect against cancer, heart disease, Type 2 diabetes and other chronic ailments. Plus, it fills you up quickly and makes clean eating a lot easier. Broccoli's sulforaphane content is responsible for most of its health benefits. According to a 2018 study published in the journal Oncotarget, sulforaphane exhibits anti-cancer properties. This natural compound has been shown to inhibit colorectal cancer cell growth and signaling while preventing them from spreading throughout the body. Another study, which appeared in the Journal of Functional Foods in 2015, has found that sulforaphane fights inflammation and oxidative stress. Due to its antioxidant and anti-inflammatory properties, it may help reduce obesity-induced system inflammation, protect against heart disease and aid in the treatment of acute lung injury. According to a 2015 review published in Antioxidants & Redox Signaling, eating three to five servings of cruciferous veggies per week may reduce cancer risk by up to 40 percent. Unlike anti-cancer drugs, sulforaphane destroys cancer cells without causing damage to healthy cells and tissues. Broccoli is also an excellent source of vitamin A, vitamin C, vitamin K, folate, calcium and manganese. One cup has only 30.9 calories and provides 135 percent of the RDA of vitamin C, 14 percent of the RDA of folate and 8 percent of the RDA of potassium. Plus, it delivers 2.4 grams of fiber, which is about 9 percent of the daily recommended intake for adults. Lutein and zeaxanthin, two potent antioxidants in broccoli, prevent the onset of age-related eye diseases like cataracts and macular degeneration. This veggie also contains the antioxidant kaempferol, which scavenges free radicals, protects against cancer and reduces inflammation. Furthermore, studies have linked cruciferous vegetables to a lower risk of breast cancer. Loaded with calcium and vitamin K, raw broccoli keeps your bones strong and may prevent fractures, according to the National Osteoporosis Foundation. Vitamin C, one of its most abundant nutrients, stimulates collagen production and slows the aging process, helping to keep your skin young. This vitamin also prevents the formation of free radicals and offsets their harmful effects on your cells and tissues. Now that you know how broccoli benefits your health, you may wonder whether you should eat this veggie raw or cook it prior to consumption. As the Dairy Council of California notes, boiling destroys up to 90 percent of the nutrients in this vegetable. Roasting, steaming, microwaving and stir-frying, by contrast, retain much of its nutritional value. Read more: What Are the Benefits of Eating Raw Vegetables? Let's take vitamin C, for example. According to a study published by the University of Illinois at Urbana, a150-gram portion of fresh-cut broccoli provides approximately 117.7 mg of vitamin C. The same amount of steamed broccoli contains 117.3 mg of this nutrient. Microwaving reduces broccoli's vitamin C content to 63.6 grams. If you prefer boiling, you'll have only 85.6 mg of vitamin C left. 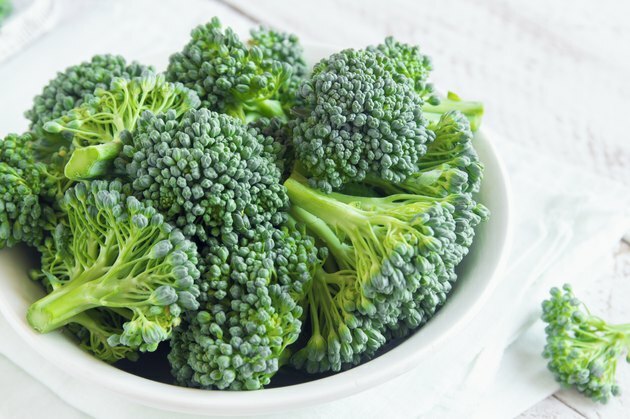 The study mentioned above also indicates that steaming has a negligible effect on broccoli's glucosinolate levels. Microwaving and boiling, on the other hand, cause leaching and breakdown of glucosinolates. Furthermore, it appears that steaming broccoli for three to four minutes increases sulforaphane formation. Researchers have also found that adding powdered mustard seeds to broccoli during cooking boosts its sulforaphane levels, so you might want to try this trick. So far, steaming appears to be the most nutritious way to eat this veggie. Plus, steamed broccoli is gentler on your digestive system. Raw broccoli is safe for most people and unlikely to cause allergic reactions. However, it may interfere with blood thinners due to its high content of vitamin K. The same goes for spinach, kale, asparagus, chard and Brussels sprouts. If you suffer from irritable bowel syndrome (IBS) or have a sensitive stomach, it's safer to eat cooked broccoli. Cruciferous veggies are notorious for their ability to cause bloating, gas and digestive discomfort, especially in people with IBS. Otherwise, they're a fantastic choice for healthy individuals. To stay on the safe side, watch your portions. Get creative in the kitchen and add broccoli to your go-to meals. Toss it with pasta and greens, use it in omelets, purée steamed broccoli or mix it into your smoothies. Mayo Clinic: Warfarin Diet — What Foods Should I Avoid? Enzymedica: Can Vegetables Cause Digestive Issues?